From Supreme to Fila Disruptors, Aine O’Boyle takes a look at the growing popularity of nostalgia and street-wear. With each new generation comes revolutionary developments in the world of fashion. The industry itself is cyclical in nature, with trends returning into fashion and new generations taking inspiration from the clothes worn by older generations. Many items of clothing will always remain fashionable, simply because they are timeless and universally stylish, but brand-new revelations in the world of fashion will make their way onto the catwalks, then trickling down into highstreet stores, becoming accessible for everyone to wear. Millennials are currently revolutionising the world of fashion as we know it. Never before has fashion been so diverse and accessible to people of all ethnic backgrounds, shapes, and sizes. One major way that millennials are shaping the world of fashion is through more sustainable buying habits. More people than ever are turning towards second-hand ‘vintage’ shops to purchase their clothes. Not only can people find some one-off gems, but it benefits the planet and is certainly a much more ethical solution to remaining fashionable whilst restraining from buying brand new clothes or falling prey to fast fashion. You would be surprised at how many vintage Versace bags you can rack up, for a mere fraction of their retail price, simply by rooting through your local Oxfam. The fashion industry is a huge contributor to global warming, and it is something that every industry needs to make a conscious effort to curtail.The fast fashion that millennials are so accustomed to is having a devastating effect on the environment as greenhouse gas emissions within the textile industry trump those of both international shipping and aviation emissions combined. 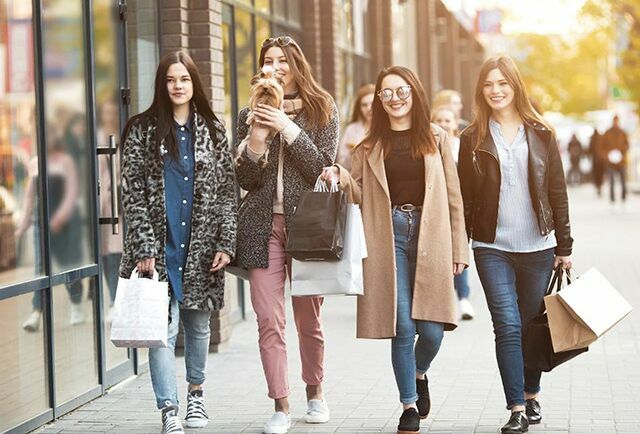 With huge consumer demand for new clothes, it’s important for millennials to recognise that not all trends are necessarily worth having, and that shopping second hand is an excellent way to reduce your carbon footprint. Away from sustainable fashion, the rise of street-wear is also something that is unique to millennials. Brands such as Yeezy, Off-White and Supreme are commonly worn by both celebrities and normal people going about their daily lives. The term ‘Hypebeast’ has been coined to describe the type of person that loves street-wear. They feed into the concept of street-wear, where the price of an item is higher depending on the demand for it. The idea of paying anything from €200 onward for a plain white t-shirt with ‘Supreme’ printed across it in red highlight may seem absurd to older generations, but for millennials, this type of clothing will be definitive of us in years to come. Virgil Abloh, the mastermind behind Off-White and now artistic director behind Louis Vuitton’s menswear is a shining example of a millennial who is re-branding the fashion industry as we know it. Abloh is representative of everything that millennials stand for in terms of fashion. He is an active user of social media and is reflective of the way fashion is diversifying and becoming more accessible to the masses. An interesting shift in the fashion industry has led fashion designers towards adopting a more utilitarian aesthetic in their clothing lines that have since trickled down onto the highstreets. Millennials have, in a sense, shifted away from the idea that high fashion is unwearable and towards shoes that they can actually walk in and clothes that feel comfortable and serve a purpose.Trench coats, bum-bags, chunky Dad trainers and utility vests have found their way onto the catwalks and the streets alike. For those of us who cannot afford a pair of Balenciaga’s Dad trainers, the obvious next choice would be a pair of Fila Disruptors or Nike Air Max 95’s. As trends go, chunky and comfortable trainers have had a strong and seemingly lasting impact. Millennials are favouring shoes that they can spend the whole day in, being comfortable and looking stylish. They are also adding modern twists to classic utilitarian wear such as bum-bags. For a long time, many of us wouldn’t be caught dead wearing a bum-bag, they were reserved for tourists and those stuck in the 80’s, but the appeal of them suddenly became apparent and now we sling them effortlessly across our shoulders or around our waists, containing our most valuable worldly goods, our phones. As far as the impact each generation has on the world of fashion goes, millennials are shaping the industry into something far different from what our predecessors made it into by revolutionising our preconceptions of fashion.